This was a good weekend for catching up on work and sleep. I always used to say that I could sleep when I was dead, but it doesn’t really work that way. You know, good tidbits you learn in your 30s that you wish you could tell your College Self. Sleep is tremendously helpful for things like functionality, coherence, and that whole not-feeling-like-crap problem. 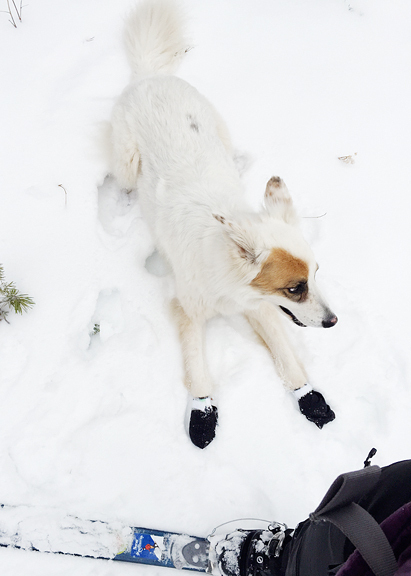 But a favorite pick-me-up is to go ski touring with a dog. I’ve never seen a “No Mushrooming” symbol before in these parts. We got a chuckle out of that because the mushroom graphic is super cute. I mean, if you really examine that symbol, it’s a bolete. And then for the rest of the trip, I had mushrooms on the brain. The last couple of times we dined at Secret Stash in Crested Butte, we ordered the stuffed mushies appetizer which quickly became our favorite. 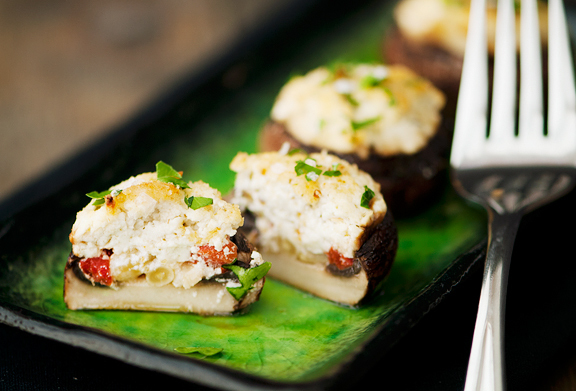 It’s hot mushroomy goodness stuffed with creamy goat cheese. Easy enough to replicate at home. So that’s what I did. 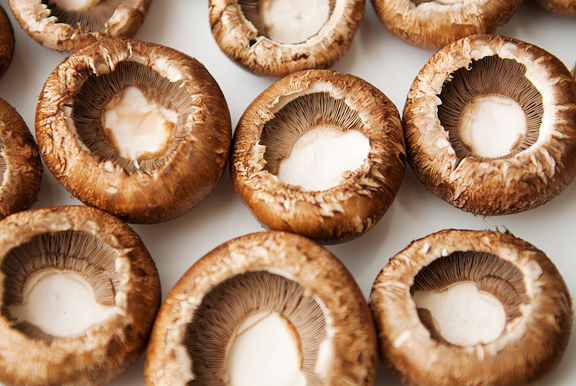 The success of this dish increases tremendously if you use mushrooms with large caps – like 2 inches in diameter. I find the crimini (or baby bella, same thing) mushrooms at Costco are the perfect size and quantity. Any larger and you’re getting beyond “bite-size”, although it’s doable that way if you want to use mature portabello caps. White button mushrooms will also work. We’re just looking for caps that can hold yummy stuff. People keep telling me that it’s okay to wash mushrooms in water and I keep wiping them clean with a damp paper towel or a mushroom brush. We’re pretty conservation-minded when it comes to water. That is probably a result of living in the west for so many years. Do whatever works for you. Set the caps upside-down in a buttered (or olive oiled) baking dish. Unless you are planning to serve individual dishes, a 9×13-inch baking pan should fit all 24 caps. Feel free to squeeze them in, taking care not to break any, because they will shrink during baking. Fill the caps with your favorite goodies – you don’t have to use the ingredients I used. Maybe add chopped sun-dried tomatoes, prosciutto, bacon, pesto. All good. Then top each cap with goat cheese. It can be herbed goat cheese (like I am using here) or plain goat cheese or some other cheese, but goat cheese will remain super creamy rather than melty/greasy. 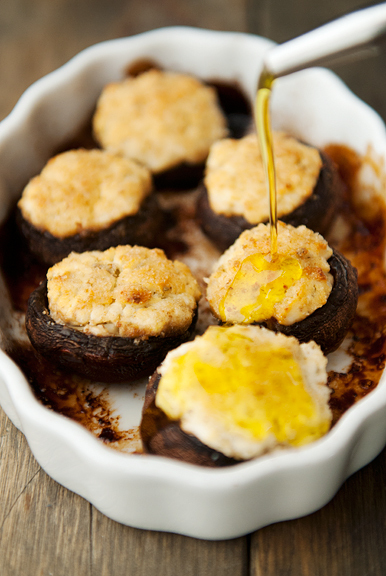 If you want to keep your stuffed mushies gluten-free, then omit the bread crumbs or use gluten-free bread crumbs. I like the extra crunch from the bread crumb topping. 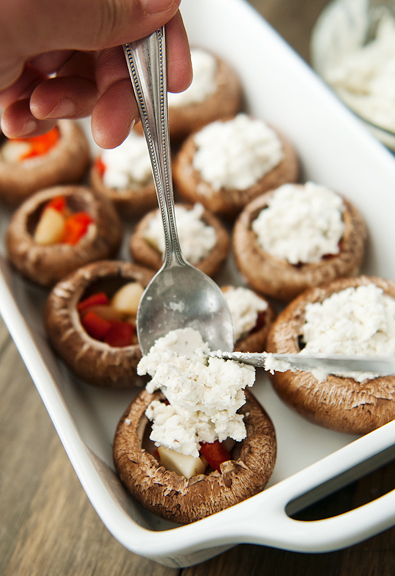 Pop those mushrooms into the oven until the goat cheese begins to turn golden on top. It took me about 35 minutes. Once out of the oven, but while the mushrooms are still hot, drizzle some olive oil over the tops and then sprinkle chopped fresh parsley (flat-leaf is best) and flake sea salt. If you opt not to garnish with flake sea salt, add a pinch of regular salt before baking – either under the goat cheese or on top. 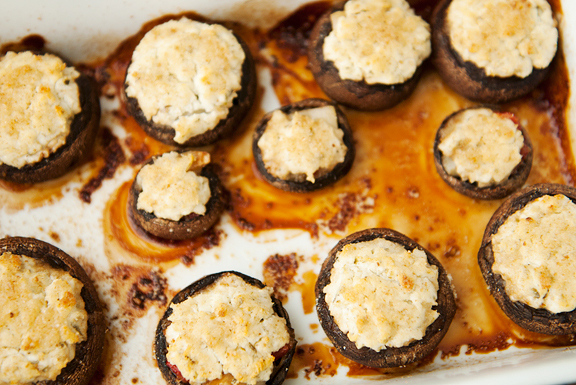 Jeremy gobbled them down, declaring between each mushroom that he loved the recipe. I think they were even better than what we got at the restaurant because we filled the mushrooms with some of our favorite things. The pine nuts lend a satisfying crunch, but if you aren’t able to eat nuts, just omit them or substitute a seed (pumpkin seeds are great). 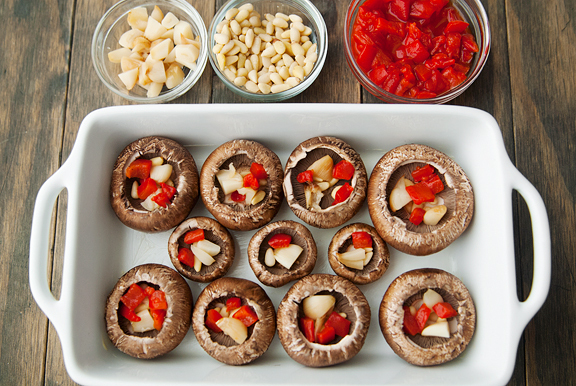 To prepare them up to a day ahead of time, just assemble the mushrooms in a baking dish, cover with plastic wrap or foil, and refrigerate until ready to bake. Absolutely addictive. 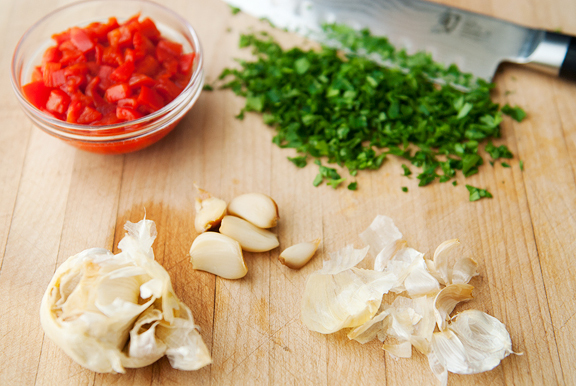 *To roast the garlic: Cut the very top of the bulb off with a sharp knife. 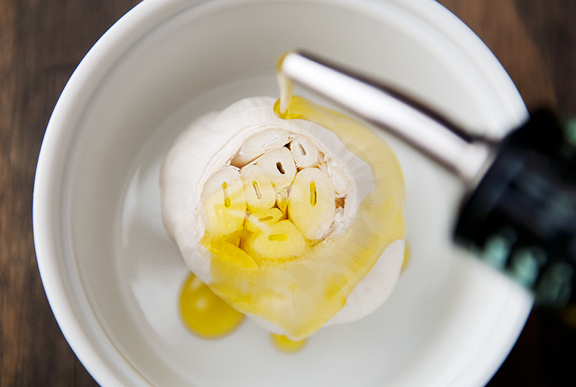 Place the bulb in a small ramekin or foil pouch and drizzle a tablespoon of olive oil over the top. Cover with foil and bake at 400°F for 30 minutes or more until the flesh is soft, golden, and nutty in flavor. Remove the cloves from the skin. Discard the garlic skins. Preheat oven to 400°F. 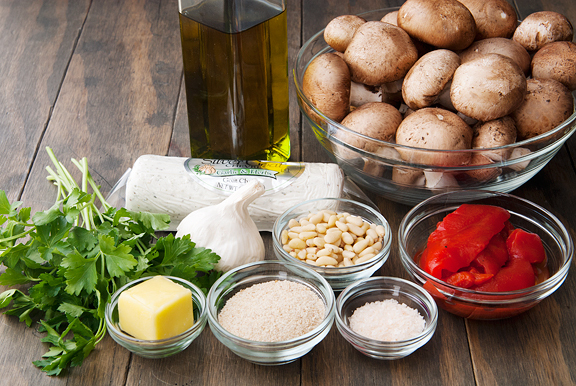 Grease a 9×13-inch baking dish with butter or olive oil. 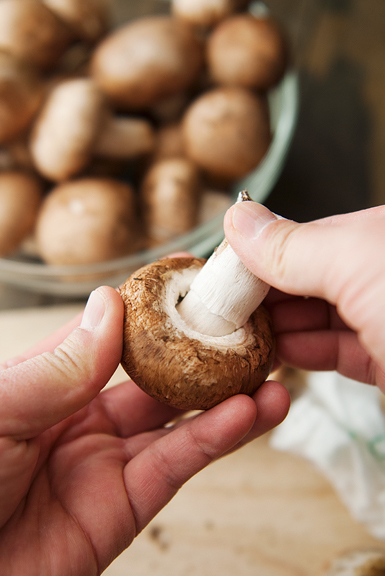 Clean the mushrooms however you like, but I recommend wiping them clean with a damp paper towel or brushing them clean. Pop the stems off the caps and discard (or compost or use for another recipe). Arrange the mushroom caps in the baking dish, top-side down. Divvy the roasted garlic evenly among the caps (cut larger cloves in half if necessary). Divide the roasted red pepper and pine nuts among the caps. Some caps will be larger than others, so distribute your ingredients accordingly. Spoon 1-2 teaspoons (or more for the really big caps) of herbed goat cheese over each mushroom. Sprinkle bread crumbs on top of all the mushrooms. Bake 35 to 40 minutes until the cheese begins to turn golden on top. Remove the mushrooms from the oven. 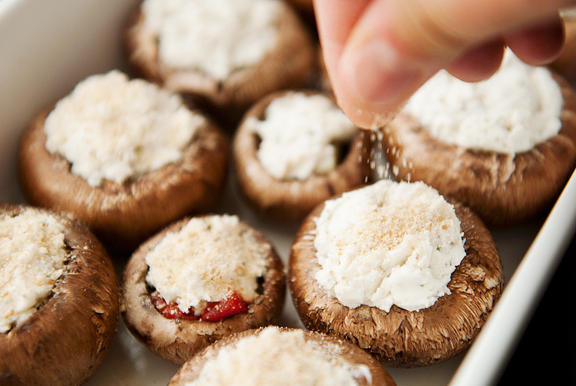 Before serving, drizzle olive oil over the stuffed mushrooms, garnish with chopped parsley, and sprinkle flake sea salt on top. Makes 24. Those look delicious! I love the ingredients you used, and prosciutto and pesto sound great too. My mind is kind of going towards pizza, so I’m also thinking capers, artichokes, and kalamata olives. 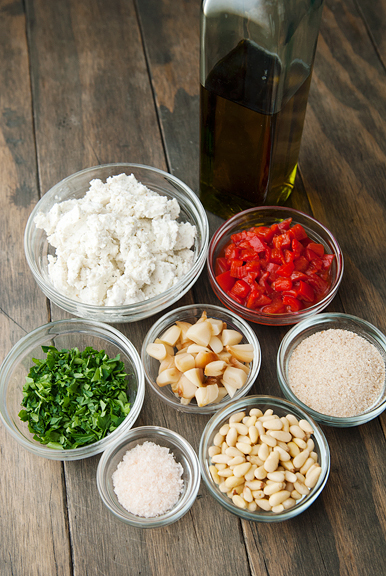 Or roasted garlic, spinach, & pine nuts….so many yummy possibilities! I’m glad I have plenty of opportunities to try these out on friends coming up, since my husband has an aversion to mushrooms. Stuffing mushrooms in goats cheese is where it’s at!! These sound perfect! I love this recipe!! 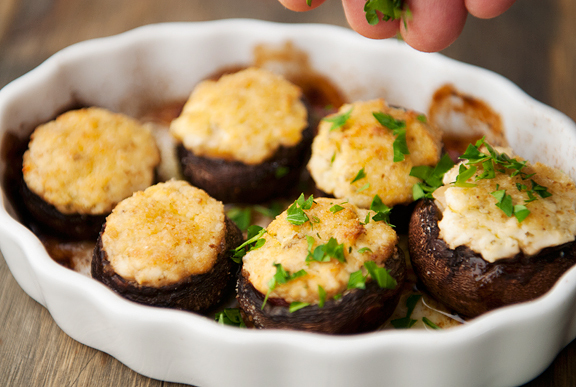 Goat cheese, mushrooms and roasted garlic, it must be delish! Looks yummy, even though I’m not the biggest mushroom fan. But that green plate!! So beautiful! I think the “no mushrooming” sign is the coolest thing I’ve seen! Love! Seriously, a no mushrooming sign! I understand everything else…but…was this one of your favorite spots? It is kinda cute tho. Don’t you know it will keep people guessing! I love reading your blog and seeing the beautiful photos posted and the delicious foods you prepare. However, I just die when I get to see Banjo!!! Erin, I love your dog! That FACE! I love, love, love the little green plate that the mushrooms are sitting on…it’s beautiful and even makes the shrooms look good (sorry I hate mushrooms)!! 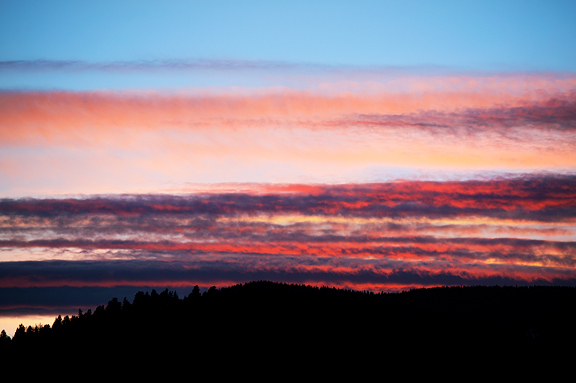 Love your blog so much my husband and I moved to Colorado so thanks for all the great photos. You sold it for us…but we chose the Western Slope as we were very tired of all the snow and cold in NH! You know what? 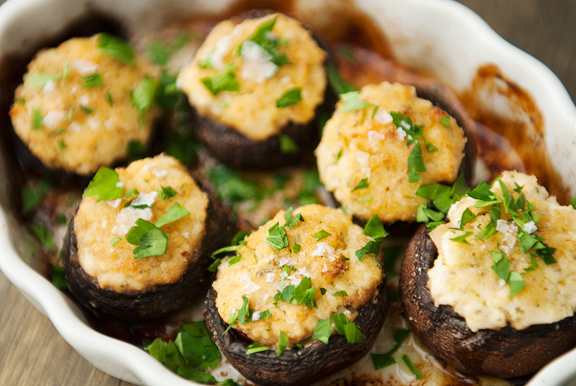 You nailed it with the goat cheese–I never realized why I don’t really like stuffed mushrooms and you’re right! Other kinds of cheese get oily and greasy and nasty! Using goat cheese is the perfect solution. Thanks to you, I’m going to give them another try! It’s time you welcome a dog back to your life. Tell Jeremy it will add sparkles of joy in your household! These look delicious! We do a similar thing in in the summer, stuffing mushrooms with either quacamole or cheese, wrapping them in bacon and cooking them on the barbecue. I don’t comment much, as so often I feel like saying “I love, love, love everything about your posts”…and that would be quite boring! But as a certified fungophile and local forager (with the “other” Erin), while the sign graphic is really sweet, I do hope the “ban” isn’t forest-wide? Can’t wait to try this recipe, and wonder if the inclusion of a wee bit of Dungeness Crab might be a good one? Bette – ha ha, me too!! jill – I think they just don’t want people walking around on watershed property. You can mushroom elsewhere (it’s a big place, the wilderness). 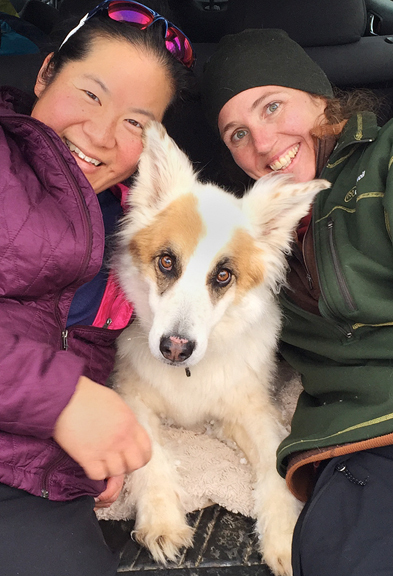 Deb W – Banjo is a super sweet and special dog. He is SUCH A GOOD DOG and definitely a cutie. Robert – it’s true. He has agreed to getting a puppy, but we have to wait for the right timing and find the right breeder. We’re getting there. I can’t wait! Nekkutyttoe – mmmm, that sounds lovely! 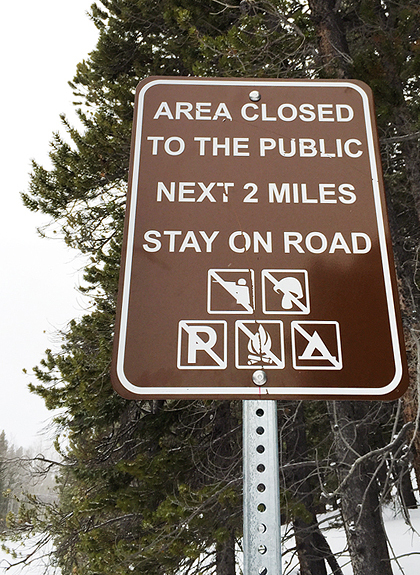 The “no mushrooming” sign actually applies to Caribou Ranch Open Space, which Rainbow Lakes Rd runs thru for about 2 miles. The watershed is in there too, and also closed. I was finding folks collecting multiple laundry baskets full of fungus. That doesn’t leave much for the elk and the squirrels. USFS and BLM allow for collecting though, and they have lots of land! 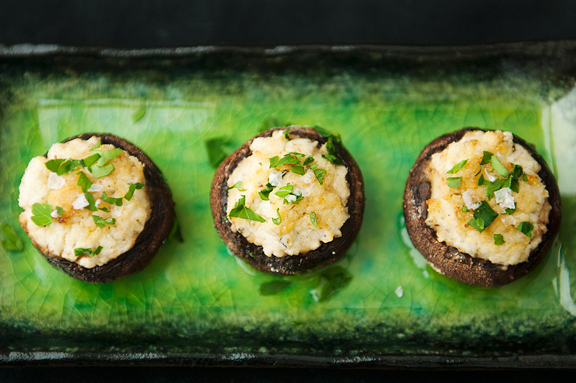 Use to cook stuffed mushrooms but I’ve never been genius enough to combine mushrooms with goat cheese. 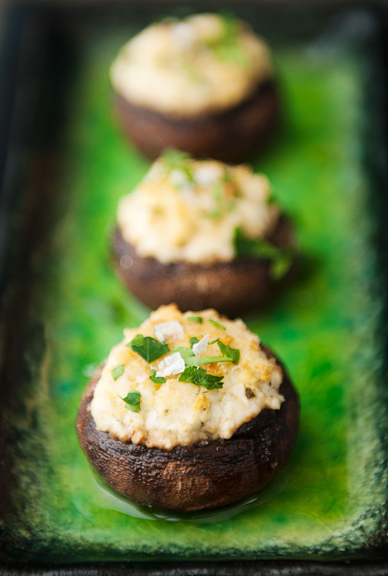 It will be my next stuffed mushrooms adventure!